Download "AUTHORITY TO REPRESENT AND CONTINGENCY FEE AGREEMENT"
2 period provided for such action, through the entry of judgment: 1. 40% of any recovery up to $1 million; plus 2. 30% of any portion of the recovery between $1 million and $2 million; plus 3. 20% of any portion of the recovery exceeding $2 million. 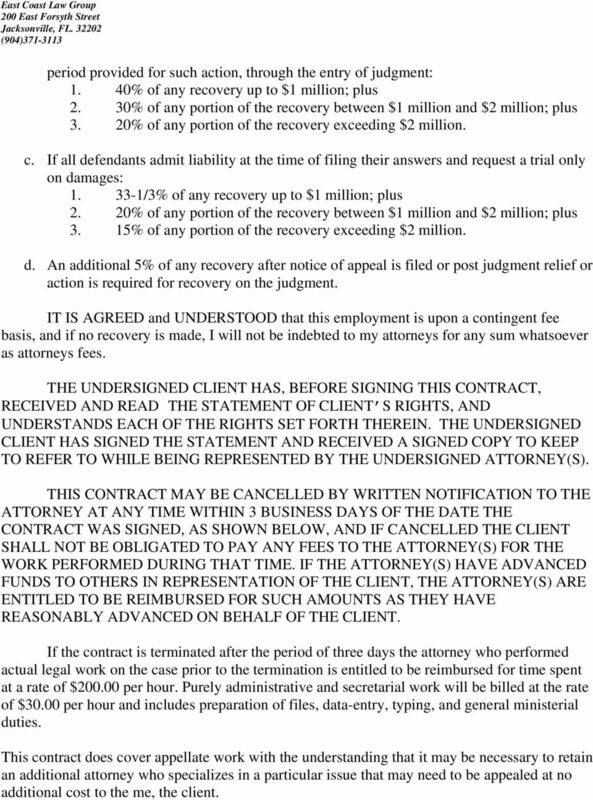 c. If all defendants admit liability at the time of filing their answers and request a trial only on damages: /3% of any recovery up to $1 million; plus 2. 20% of any portion of the recovery between $1 million and $2 million; plus 3. 15% of any portion of the recovery exceeding $2 million. d. An additional 5% of any recovery after notice of appeal is filed or post judgment relief or action is required for recovery on the judgment. IT IS AGREED and UNDERSTOOD that this employment is upon a contingent fee basis, and if no recovery is made, I will not be indebted to my attorneys for any sum whatsoever as attorneys fees. 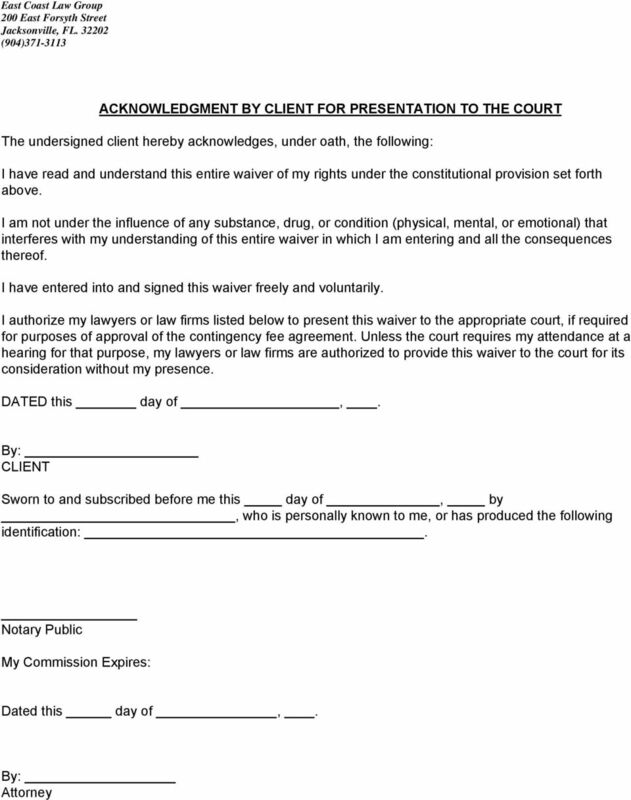 THE UNDERSIGNED CLIENT HAS, BEFORE SIGNING THIS CONTRACT, RECEIVED AND READ THE STATEMENT OF CLIENT S RIGHTS, AND UNDERSTANDS EACH OF THE RIGHTS SET FORTH THEREIN. THE UNDERSIGNED CLIENT HAS SIGNED THE STATEMENT AND RECEIVED A SIGNED COPY TO KEEP TO REFER TO WHILE BEING REPRESENTED BY THE UNDERSIGNED ATTORNEY(S). 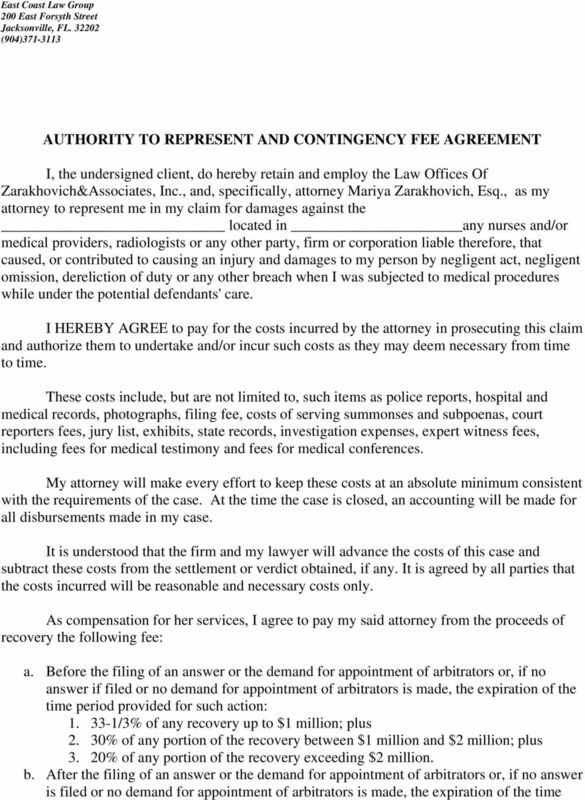 THIS CONTRACT MAY BE CANCELLED BY WRITTEN NOTIFICATION TO THE ATTORNEY AT ANY TIME WITHIN 3 BUSINESS DAYS OF THE DATE THE CONTRACT WAS SIGNED, AS SHOWN BELOW, AND IF CANCELLED THE CLIENT SHALL NOT BE OBLIGATED TO PAY ANY FEES TO THE ATTORNEY(S) FOR THE WORK PERFORMED DURING THAT TIME. IF THE ATTORNEY(S) HAVE ADVANCED FUNDS TO OTHERS IN REPRESENTATION OF THE CLIENT, THE ATTORNEY(S) ARE ENTITLED TO BE REIMBURSED FOR SUCH AMOUNTS AS THEY HAVE REASONABLY ADVANCED ON BEHALF OF THE CLIENT. If the contract is terminated after the period of three days the attorney who performed actual legal work on the case prior to the termination is entitled to be reimbursed for time spent at a rate of $ per hour. Purely administrative and secretarial work will be billed at the rate of $30.00 per hour and includes preparation of files, data-entry, typing, and general ministerial duties. This contract does cover appellate work with the understanding that it may be necessary to retain an additional attorney who specializes in a particular issue that may need to be appealed at no additional cost to the me, the client. 4 WAIVER OF THE CONSTITUTIONAL RIGHT PROVIDED IN ARTICLE 1, SECTION 26, FLORIDA CONSTITUTION On November 2, 2004 voters in the State of Florida approved The Medical Liability Claimant's Compensation Amendment that was identified as Amendment 3 on the ballot. The amendment is set forth below: The Florida Constitution Article 1, Section 26 is created to read "Claimant's right to fair compensation." In any medical liability claim involving a contingency fee, the claimant is entitled to receive no less than 70% of the first $250,000 in all damages received by the claimant, exclusive of reasonable and customary costs, whether received by judgment, settlement or otherwise, and regardless of the number of defendants. The claimant is entitled to 90% of all damages in excess of $250,000, exclusive of reasonable and customary costs and regardless of the number of defendants. This provision is self-executing and does not require implementing legislation. 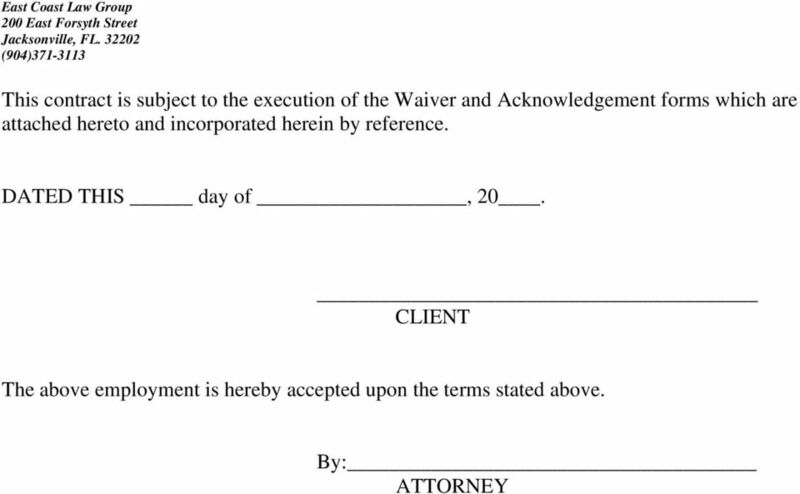 The undersigned client understands and acknowledges that (initial each provision): I have been advised that signing this waiver releases an important constitutional right; and I have been advised that I may consult with separate counsel before signing this waiver; and that I may request a hearing before a judge to further explain this waiver; and By signing this waiver I agree to an increase in the attorney fee that might otherwise be owed if the constitutional provision listed above is not waived. Without prior court approval, the increased fee that I agree to may be up to the maximum contingency fee percentages set forth in Rules Regulating The Florida Bar 4-1.5(f)(4)(B)(i). Depending on the circumstances of my case, the maximum agreed upon fee may range from 33 1/3% to 40% of any recovery up to $1 million; plus 20% to 30% of any portion of the recovery between $1 million and $2 million; plus 15% to 20% of any recovery exceeding $2 million; and I have three (3) business days following execution of this waiver in which to cancel this waiver; and I wish to engage the legal services of the lawyers or law firms listed below in an action or claim for medical liability the fee for which is contingent in whole or in part upon the successful prosecution or settlement thereof, but I am unable to do so because of the provisions of the constitutional limitation set forth above. In consideration of the lawyers or law firms agreements to represent me and my desire to employ the lawyers or law firms listed below, I hereby knowingly, willingly, and voluntarily waive any and all rights and privileges that I may have under the constitutional provision set forth above, as apply to the contingency fee agreement only. Specifically, I waive the percentage restrictions that are the subject of the constitutional provision and confirm the fee percentages set forth in the contingency fee agreement; and I have selected the lawyers or law firms listed below as my counsel of choice in this matter and would not be able to engage their services without this waiver; and I expressly state that this waiver is made freely and voluntarily, with full knowledge of its terms, and that all questions have been answered to my satisfaction. 6 ARTICLE I, SECTION 26. Claimant's right to fair compensation. (a) Article I, Section 26 is created to read Claimant's right to fair compensation. In any medical liability claim involving a contingency fee, the claimant is entitled to receive no less than 70% of the first $250, in all damages received by the claimant, exclusive of reasonable and customary costs, whether received by judgment, settlement, or otherwise, and regardless of the number of defendants. The claimant is entitled to 90% of all damages in excess of $250,000.00, exclusive of reasonable and customary costs and regardless of the number of defendants. This provision is self-executing and does not require implementing legislation. (b) This Amendment shall take effect on the day following approval by the voters. History. Proposed by Initiative Petition filed with the Secretary of State September 8, 2003; adopted 2004. IN THE SUPREME COURT OF FLORIDA CASE NO. SC05-1150 COMMENTS OF DAN CYTRYN, ESQUIRE OF LAW OFFICES CYTRYN & SANTANA, P.A. IN THE SUPREME COURT OF FLORIDA CASE NO. SC05-1150 IN RE: PETITION TO AMEND RULE 4-1.5(F)(4)(B) OF THE RULES OF PROFESSIONAL CONDUCT / COMMENTS OF DAN CYTRYN, ESQUIRE OF LAW OFFICES CYTRYN & SANTANA, P.A. Comparison of Newly Adopted Florida Rules of Professional Conduct with ABA Model Rules FLORIDA New rules as adopted by Florida Supreme Court to be effective 5/22/06. Revision to Rule 1.5(f) effective 9/29/06. Pg 1 of 10 UNITED STATES BANKRUPTCY COURT SOUTHERN DISTRICT OF NEW YORK -----------------------------------------------------------x In re: SOUND SHORE MEDICAL CENTER OF WESTCHESTER, et al., 1 Debtors. Any civil action exempt from arbitration by action of a presiding judge under ORS 36.405. PAYMENT/PERFORMANCE BOND. This is the front page of the payment/performance bond issued in compliance with Florida Statutes 255.05. Federal Workers Compensation Consultants, Inc. Social Security Disability Representatives 9639 North Armenia Ave., Tampa, Fl. Social Workers' Professional Liability Insurance Endorsement THIS ENDORSEMENT CHANGES THE POLICY. PLEASE READ IT CAREFULLY.